Since a very young age, Dr Martin Allen has been fascinated with coins. Here, in an exclusive interview, the author of ‘Mints and Money in Medieval England’, explains how this childhood fascination was the start of a life-long interest in medieval coinage, culminating in this definitive study. As a schoolboy in the 1960s I became fascinated by the coins in circulation, which in those days included Victorian pennies up to a century old. My interest deepened when I discovered that I could buy medieval coins with pocket money, and by the time I was an undergraduate I was thoroughly hooked, doing research into medieval coins as a welcome distraction from the studies I was supposed to be doing. So began a life-long interest in medieval monetary history which has found its culmination in the work for this book. What were the greatest challenges you faced in writing ‘Mints and Money in Medieval England’? The literature of coinage and mints in medieval England is vast, and much of it is hidden in rather obscure publications. My task was to make sense of all of this in one simple, coherent story, avoiding technical jargon as much as possible. There was a constant need to have a fresh view on every aspect of the subject, taking nothing that anybody else had written on trust, and bringing new evidence to bear on some of the most difficult problems. How does the history of mints sit within the broader context of Medieval English society? Money was the lifeblood of medieval English society. The king’s government could not function without money to pay for the maintenance of its power at home and its wars abroad. Commerce and agricultural production for the market would have ground to halt without it, and urban society could not have functioned without the means to pay for the needs of everyday life. I believe that it is important for us to understand where this money came from, and what factors governed the size and nature of the money supply. How do the English mints compare with what was happening on the Continent? England was never isolated from what was happening on the Continent, in the Middle Ages as today. The development of English mints from small local workshops making limited amounts of one coin (the silver penny) to factories often making millions of larger silver coins or gold coins every year had many parallels elsewhere in Europe. When medieval Europe suffered catastrophic declines in supplies of precious metals and the coinage made from it England was usually also affected. What made England different was its determined resistance to the temptation to reduce the gold or silver content of the coinage, when many Continental mints were doing this to generate revenue for their governments or for sound economic reasons. Strong money was an article of faith for all English governments until Henry VIII debased the coinage in the 1540s. How does ‘Mints and Money in Medieval England’ fit within your wider academic interests and research? ‘Mints and Money in Medieval England’ is absolutely central to my work as a curator at the Fitzwilliam Museum and as a university teacher. It is the culmination of all of my research since I first came to Cambridge nearly fifteen years ago, bringing it together and taking it to another level. It is a constant source of reference when I am dealing with enquiries as a museum curator, and it is already proving its worth as a textbook with my students. ‘A New History of the Royal Mint’ (Cambridge University Press, 1992) has a broader historical scope, including the early medieval and modern periods not covered by my book. The Fitzwilliam Museum in Cambridge has one of the best collections of medieval coins in the world, which is being published in the Cambridge University Press Medieval European Coinage series. Having experienced the horrors of writing student essays and dissertations in the 1970s with a typewriter I am eternally thankful for the invention of the PC. How did we manage without it? Money, money, money (with apologies to ABBA). I was given a copy of ‘Treasure Island’ at one early childhood Christmas that may have sparked my interest in treasure and hoards, which I can now indulge in professionally. Yes, several books – but revealing what they are really would be giving hostages to fortune. 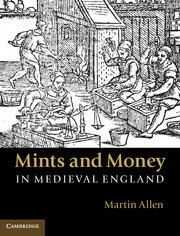 Dr Martin Allen is author of ‘Mints and Money in Medieval England’ (out now). He is a Senior Assistant Keeper in the Department of Coins and Medals at the Fitzwilliam Museum, University of Cambridge and an Affiliated Lecturer in the Faculty of History. His first book, The Durham Mint (2003) was awarded the North Book Prize of the British Numismatic Society and his numerous publications and research have established his reputation as one of the leading experts on the money and coinage of medieval England.